Video collaboration is becoming a progressively vital business communications tool; in fact, business Internet video is estimated to increase more than 30 percent each year through 2018. However, many business owners are unfamiliar with equipment options and logistical issues and also are unsure how to estimate the cost of video for their daily business usage. Instead, it may be better to consider the cost of not making the investment. By postponing an investment in video conferencing, you likely are missing out on the opportunity to maintain a competitive edge and provide quality customer care – even recruiting can be adversely affected. 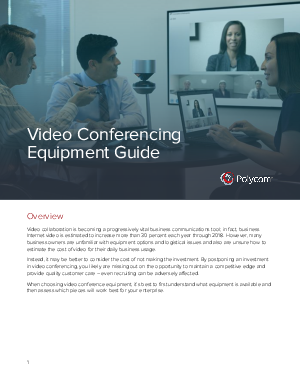 When choosing video conference equipment, it’s best to first understand what equipment is available and then assess which pieces will work best for your enterprise.